How much of the pattern of Medieval Malton still exsists? That was the question this project sought to answer. A group of seven local people under the guidance of archaeologist Dr Patrick Ottaway set out with notepads and tape measures to record the widths of all the building frontages and alleyways along the main streets in the centre of Malton. Using this data the task was to establish if the pattern of the original burgage plots could be indentified. But what is a burgage plot? When the town of New Malton was created in the late 12th century the main streets that we see today were laid out. Long plots (the burgage plots), set out at right angles to these streets, were leased by the Lord of the Manor to tradesmen (called burgesses) who paid rent for them. The plots would have been laid out in a regular manner based on the historic measurement of the ‘perch’, which was commonly 16ft 6ins (5.03m) in length. Over time the original plots were subdivided to create more properties along the street fronts, but otherwise the widths of the plots tended to remain fixed throughout the following centuries. It was only from the mid 19th century that larger-scale redevelopment started to merge adjacent plots and hide some of the earlier boundaries. However, in spite of all the changes that have taken place in the past, our measurements showed that in most areas of the centre of Malton it is still possible to detect the use of the 16ft 6ins perch. Interestingly, there are two areas of the town, in Castlegate and on the south-east side of the Market Place, where a perch length of 18 ft (5.49m) has been used. Patrick Ottaway’s work in York would suggest that these areas are older and might possibly have been in existence before New Malton was created. Download a copy of the full project report (PDF, 5 MB). This project was funded by Arts Council England and the Heritage Lottery Fund. My name is Hannah and I am a Masters student at the University of York. Over the past few months I have been working with Malton Museum on the ‘Malton Memories’ project, a Heritage Lottery funded oral history project which aims to show Malton and Norton through the eyes of those who know it best; the local community. 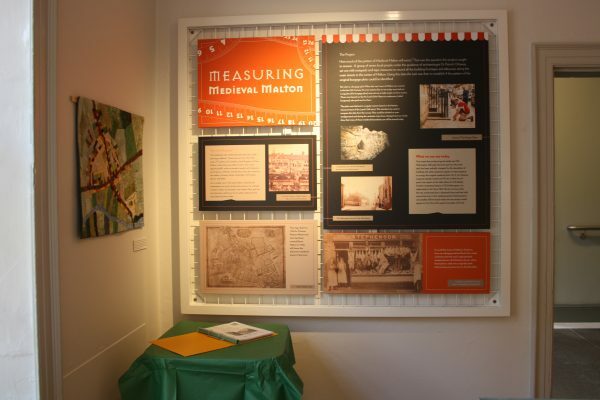 Since 2016 when the project was initially set up, volunteers from Malton Museum have been working both with members of the local community and visiting tourists in order to gather fascinating insights into Malton and the surrounding area in times gone by. Volunteers from the museum have also worked with Racing Welfare and Slingsby Local History Group, in order to gather as many varied memories as possible. Through this work, we have managed to gather a bank of oral histories and written testimonies which will be included within the display in the museum. Taking advantage of the fantastic memories we have gathered, I have been working to create a publication which collate a selection of the memories and forms part of the ‘Malton Memories’ exhibition in the Museum. It has been incredible to be given the chance to work so closely with the museum, having been involved in a variety of activities, including setting up a pop-up exhibition which we held in the library to try and improve the visibility of the project within the local community. This proved to be a brilliant opportunity to engage with a variety of people and was an enjoyable few hours which gave us the chance to hear lots of unique and personal stories. I love working with people, so it has been lovely to chat to locals about their memories; one that will stick with me is that of a gentleman who kindly sat and chatted with us, telling us how he used to be the self-proclaimed ‘cab mascot’ for his dad when delivering animal feed to local farms as a little boy. Local farmers would provide cakes and a cuppa for them on their travels and the evening meal was a chocolate bar and a can of pop! Not knowing the local area very well beforehand, it has been really rewarding to learn about the history of Malton and Norton, particularly through the form of oral history. I find it is always much more interesting to hear about the local area from those who have experienced the town and its many changes, providing a much more personal perspective on the area. ‘Malton Memories’ has been a brilliant project to be involved with and I have thoroughly enjoyed working with the museum, it has provided invaluable experience for me and I am extremely grateful to all involved. In my future career I would love to be able to work in a role which involves public engagement and the visitor experience, so working on this project with Malton has been a fantastic opportunity and really good fun! The project is still ongoing, so please do get in touch with the museum if you feel you have any memories you could contribute! There is also a box in Malton library where you can drop off your written memories if you prefer. In May 2017, we worked with first year archaeology undergraduate students from the University of York. Tasked with the idea of creating a digital output to be used online, and potentially in the museum, the students embraced the project and the game ‘How long would you survive in Roman Malton?’ was born. The brief given to the students was to create something to appeal to a younger audience, using Fido, our museum dog icon as the guiding figure. The students spent time with the museum volunteers, looking at objects in the store and seeing how and what the museum currently did for families and in schools. The students then pitched their ideas to the volunteers and a plan was agreed. The students would create a series of scenarios and ask the ‘player’ to make certain choices. The ultimate goal was to see if you could survive until the age of 52 years in Roman Malton. The game was then tested with volunteers, a school group and visitors to the museum, before the final version, which you see today, was completed. The students blogged about their experience which can be seen at https://derventiobrigantum.wordpress.com/. The group recently assisted the museum with a research project based on an indenture, which features in the exhibition between a young boy, Fred Witty with a local baker in 1888. The report is now displayed alongside the indenture in the exhibition. In 2016, Malton Museum asked Malton and Norton District Camera Club to respond to the theme of Malton Goes to Market. The members were asked to explore creatively the local heritage and capture a snapshot of life in Malton and Norton today. The successful images then featured within the exhibition and a catalogue. In 2014 Malton Museum participated in a joint project with Kirkbymoorside Camera Club, Malton Castle Garden volunteers, and artist Peter Coates explore the history of Malton’s castle, through a display and magnificent sculptural feature on a newly-restored stretch of wall in the gardens.